[Patrick] was prepping for some future projects he had in mind, for which he will need a simple 2D array of addressable LEDs. While it is certainly possible for him to build his own LED array and control hardware, he thought he would try out some off the shelf products to see if something might fit his needs. He picked up a strip of addressable RGB LEDs from Adafruit, and while they worked very well, they were a bit too pricey for the amount of LEDs he knew he would need. 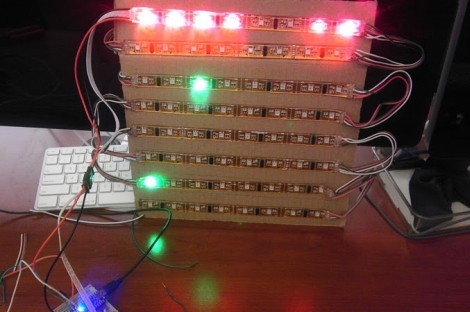 He picked up a strip of similar LEDs without PWM capabilities built-in, and gave those a spin – they worked well enough, so he got to work building his LED array. While LED strips might not jump right out as the best way to make an LED array, they can be easily cut and rearranged without any issue, provided you solder in a couple of wires to connect the disjointed strips. [Patrick] did just that, and wrote a small Arduino library that allows for easy control of the grid. We’re not sure if he plans on scaling these arrays any larger than 8×8, but we are definitely interested to see what he has in store for them. Check out a quick video of his LED array in action below. Might want to make it clearer that these are digital led strips, not regular led strips. Can you use PWM to alter the brightness? PWM not being built into the strips doesn’t mean that it is not possible to do with the micro. Yes & no. The chip doesn’t support PWM directly, but you can hack it up using interrupts (and a lot of CPU). Adafruit has a tutorial and (1-D) library. With those addressable strips it does. There is uc’s on the strip, 1 for each 2-LED segment (notice the little black uc’s in there). If those chips aren’t set up for PWM you can’t PWM the LEDs. Trust me, I have some of these strips and I use them all the time. I would love to have some animated lights for Christmas lights but they are simply too expensive. I hope someone can figure out a way to have fun with non-addressable LED strips. They are truely inexpensive. I don’t mean to make them addressable. But maybe modified into shorter addressable strips. Or some how make it appears as dimmable.